This plot consists of data taken by the Deep Impact's medium-resolution instrument before the mission's scheduled collision with comet Tempel 1. 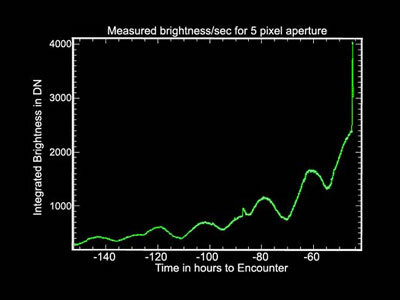 It shows the total brightness of the comet versus time until impact. Two outbursts of the comet can be seen as sharp peaks. One occurred three and two-third days before impact, and another just less than two days before. The large-scale, more gradual peaks are due to the rotation of the elongated comet nucleus. One rotation period is 41.85 hours. These data were acquired by the mission's navigation team.